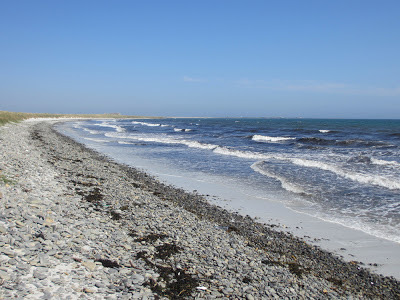 Of all the beaches on Sanday, Doun Helzie is the one I liked best. 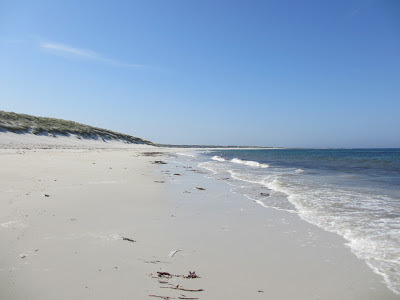 ESE facing, we arrived in a stiff NW breeze and lay our backs against the dunes, completely sheltered from the wind, the shallow sea barely lapping the beach. To the north, seaweedy ribs of rock burst through the sands, holding rockpools ripe for investigation by young beachcombers. 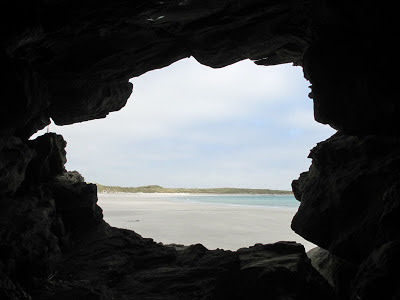 To the south, the beach is bordered by low cliffs, punctured clean through by caves. 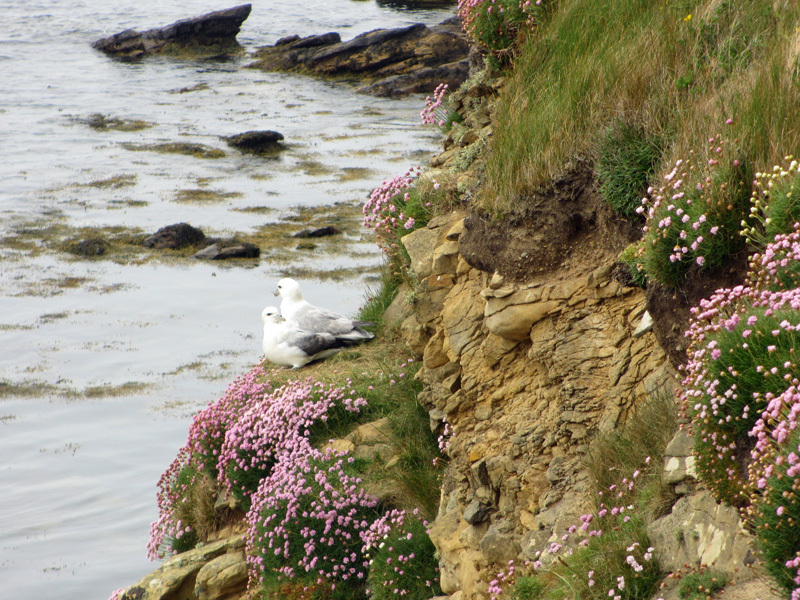 Fulmars and oystercatchers were everywhere, wondering who was trespassing on their beach, and we picnicked and watched terns fishing just offshore. We spent several hours at Doun Helzie, and didn't see another soul. Doun Helzie is the perfect family beach - though be aware that the base of the cliffs is inaccessible at high tide. 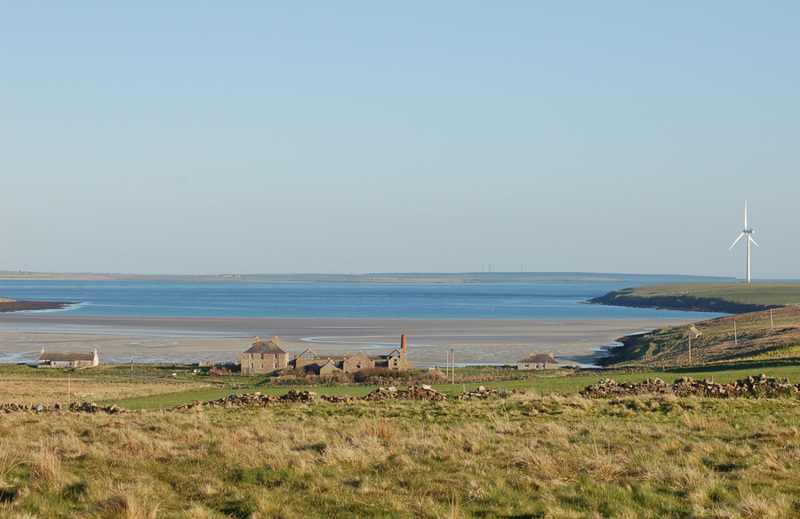 A great walk can be had at Doun Helzie, across to Stove Bay and the west side of Spurness, up to Braeswick and back or - if time and energy levels permit - as far as Pool and back over The Wart, at 65m the high point of Sanday. The western side of Spurness consists of low, rocky cliffs, the clifftops full of wildflowers and rabbits. A bull and his ladies shambled over to stare at us. A cormorant, drying its wings in a sudden cleft in the rocks was uncomfortable with our presence and we moved on. I watched a lone gannet fishing and a short eared owl hunting, the tide running between here and the bleak shores of Calfsound, and thought of Vikings. It is not every day someone bungs free stuff my way, and when it is a Berhaus Carrock jacket, I'll happily review it. I already have a Berghaus jacket I bought a couple of years ago (not sure what model but it is thin, blue, very similar to the Mera Peak and says 'Goretex pro shell Extrem' on it), so a comparison would be interesting. My own interests in any jacket are to go up hills and not get wet and cold, so how does it shape up to that end? The jacket is light and thin, yet still feels fairly tough. I like this thinness a lot, as it makes for a more versatile, year-round jacket - the same jacket can be worn in summer rains as well as winter storms, by wearing different layers underneath. This also means it packs away into a decent size - unlike some other jackets, it is not going to take up half your rucksack when the sun comes out. A mesh holds the wicking Goretex away from the body, adding an extra level of breathability. There is a general lack of seams and complicated tailoring, which aids waterproofing and durability. It has a nice green colour, ideal for the hill. The jacket, although XL (I prefer a size larger than my own L, so I can get plenty layers underneath in winter and retract my hands into the sleeves), is slightly shorter than I prefer and sitting on a wet surface will give you a wet arse - my own jacket is longer and the hem can be sat on. The next thing I noticed about the Berghaus Carrock is that it has a stowaway hood. Immediately alarm bells rang. 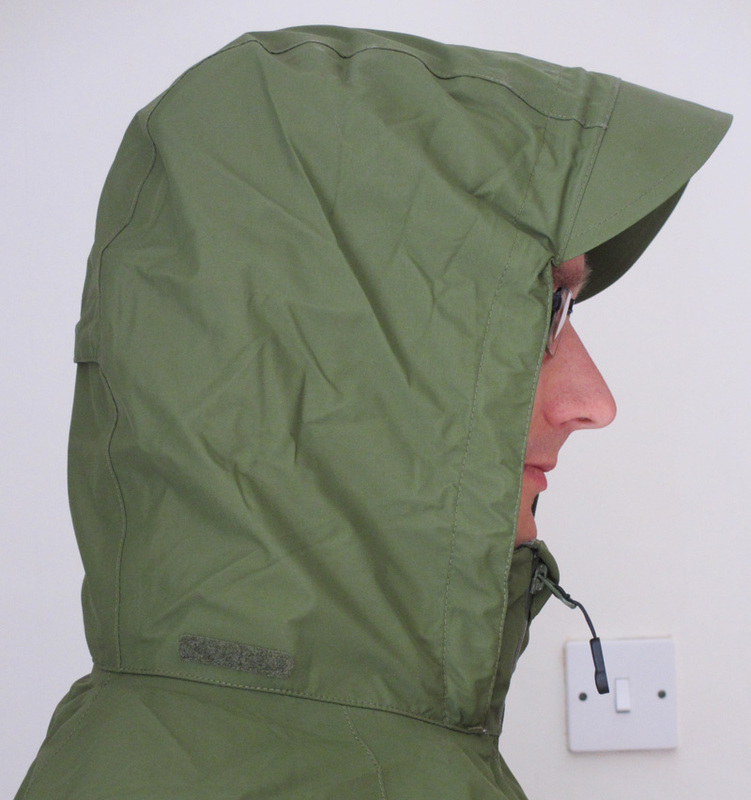 For me the single most important feature of any hill jacket is a good deep hood. This is a surprisingly hard thing to find on a jacket (when I bought my current one, it and the Berghaus Mera Peak had a good hood, and they were about the only ones in the shop that did). Some might want to faff about with a hood that lets in stinging rain from the side, but I don't. I want a hood like Kenny from South Park. And my fears were justified on rolling the hood out. It has a wonderful, long peak but, for some reason, cutaway sides. This is a hood that is going to chill your face in bad weather. The only excuse is that most other manufacturers also produce inadequate hoods - you will struggle to find the kind of hood I like. One of the wonderful things about new jackets is the waterproofing. This eventually degrades and never seems to be as good again, even when reproofed. But stand under a hose in the Carrock and the water just beads off as if off a duck's back. Five minutes in the shower with the Carrock and my upper half was bone dry. Of course the real test of waterproofing and breathability is not a few minutes under a shower, but a day sweating on the hill in a downpour. It has been such a nice summer though, I have so far been unable to test this! The Carrock is made from performance shell Goretex, which was the top standard for breathability for ages. It has been overtaken by pro shell Goretex, and Paramo claim their Event fabric is even better still (though I've never owned a Paramo, so can't confirm this). The truth is you are never going to get perfect breathability if you are sweating hard in a downpour - and in other conditions, I suspect it is hard to tell the various fabrics apart. The gold standard of a few seasons ago will still perform well. Underarm zips (double-flapped to keep rain out) aid sweat loss in humid conditions, and conversely, Velcro wrist bands and adjustable waist ties make a snug seal in cold and windy conditions. The Carrock has four pockets, two external ones for hands and an external and internal chest pocket. As a nice detail, all zip pulls are metal for durability and have toggles, essential for operation when wearing gloves. The external pockets have sealed zips to aid waterproofing though my personal experience is that no external pockets are ever truly waterproof. For this reason I like to put my map (usually folded at the place of interest) in the inside chest pocket. 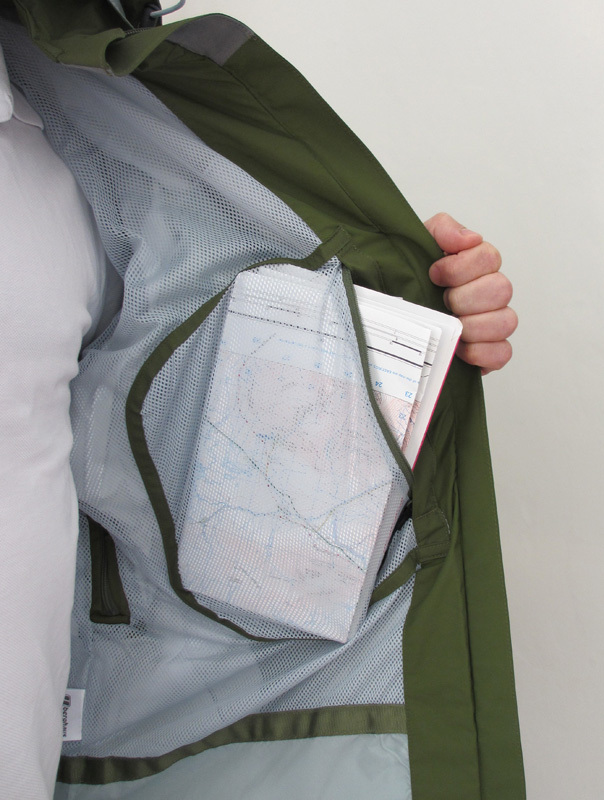 The Carrock has an inside map pocket which just fits a standard OS Landranger map. However open the map and fold it at the place of interest, and it no longer fits in any of the pockets. (My own Berghaus jacket comfortably fits a map folded like this, however only in an external pocket and so in prolonged rain the map is going to get wet). This is not just a fault of the Carrock, it is almost impossible to find a jacket with a really cavernous internal map pocket that will actually fit a map that has been custom-folded. If any manufacturers are reading, please pick up on this point! 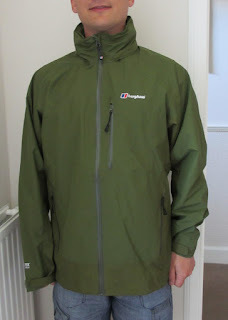 The Berghaus Carrock is a really good jacket from the Berghaus men's waterproof jackets range. It is almost a really good hillwalking jacket. 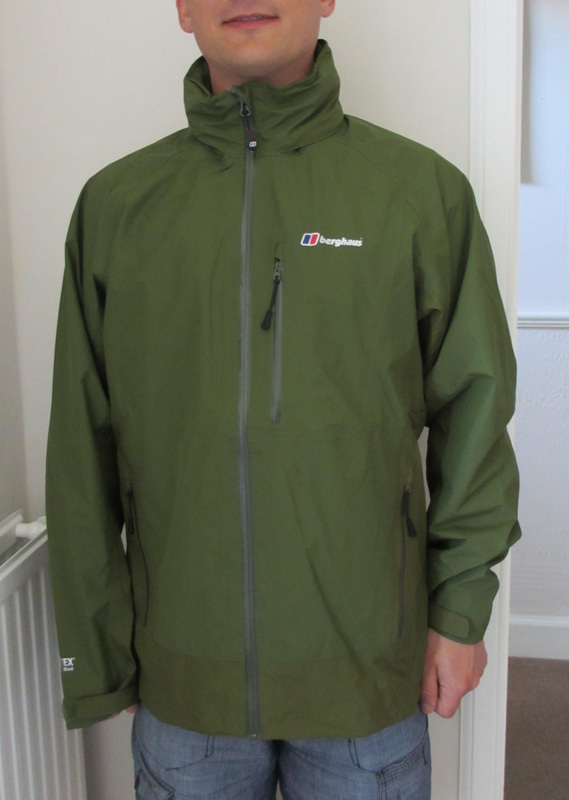 The fit, the waterproofing, the durability, the light weight, the colour, the detailing, the inside map pocket, all make for a jacket that you could do serious hillwalking in at a very reasonable price. And yet the hood (as with many other jackets to be fair) makes walking in strong wind and rain unpleasant. I suppose Berghaus are selling at this price as a trail jacket, rather than a full on hillwalking jacket. But in that respect it falls between two stools. This is too good a jacket just to walk the dog in. But because of the hood, I wouldn't trust my comfort to it in on Clisham in the rain. 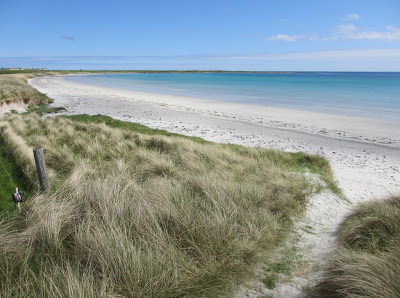 Of all the many fine beaches on Sanday, the most remarkable must be Cata Sand. 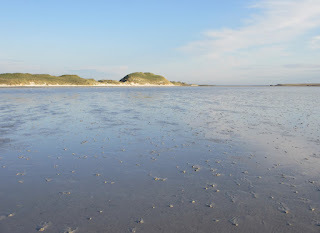 A vast, shallow bowl with a narrow inlet, Cata Sand looks like a loch at high tide. 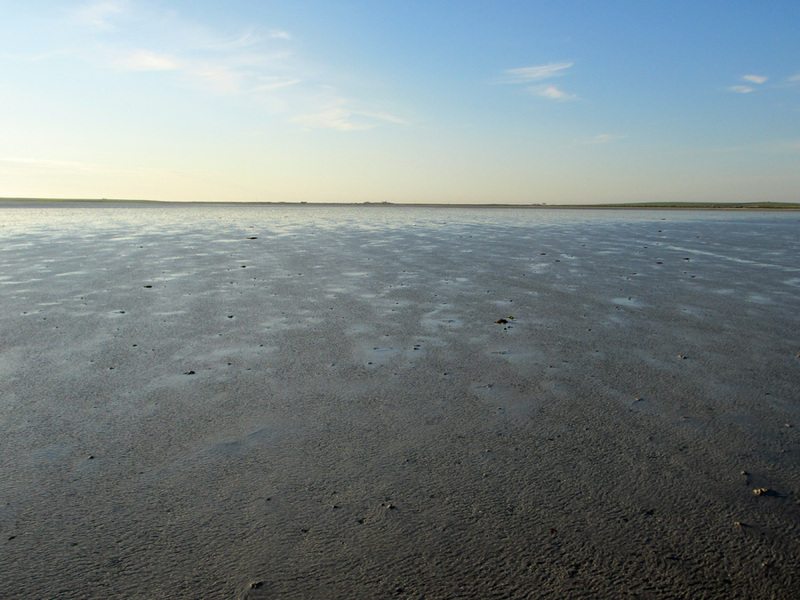 At low tide, it is totally transformed. From Lady village, it is possible to walk towards the farm of Tresness on the other side of Cata Sand. 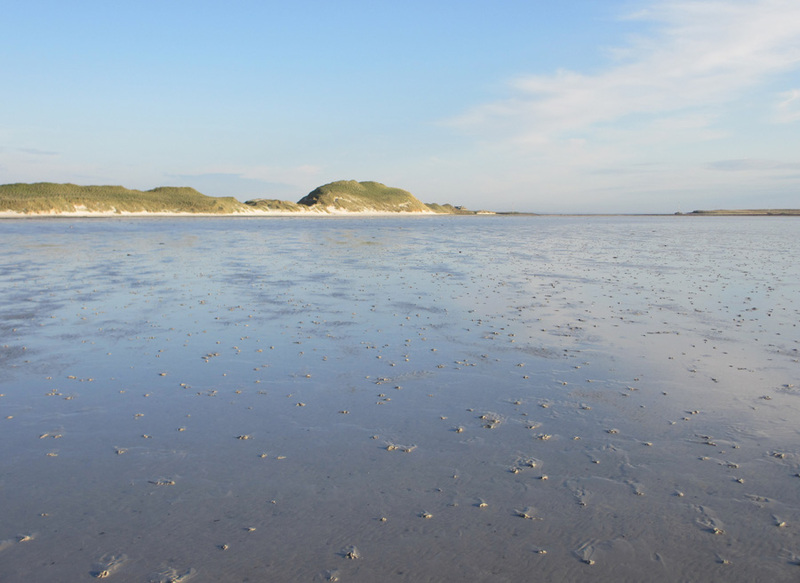 The expanse of sand revealed at low tide contains millions upon millions of lugworm casts. Halfway across, the distant dunes - a landmark across the whole of the south coast of Sanday - approach. Look back, and you realise how much beach you have traversed already. Near the safety of the dunes tyre tracks mark the sand, driving around the edge of the bay in a big arc. Tresness is not accessible at high tide! Scrambling up to the top of the dune reveals a breathtaking panorama, especially on an evening flooded with light and filled with wind. 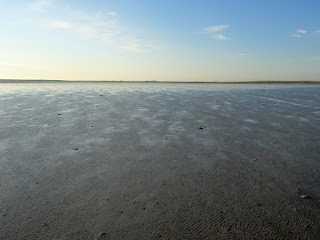 The big bay of Cata Sand appears on one side, the long surf of Newark Bay on the other, a thin strip of marram-knitted sand the only thing preventing Tresness from being an island. 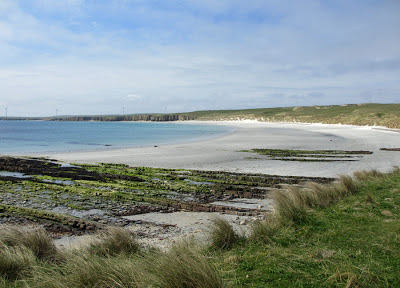 Sanday is the largest of the islands to the north of Orkney mainland, but unlike bustling Westray it feels quiet and remote (though perhaps Westray was particularly bustling as our only visit was during the inter-isles sports day). From our home in Scotland's Central Belt, Cornwall is quicker to reach than Sanday. 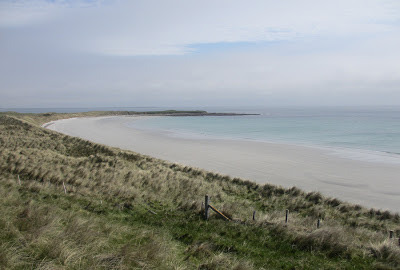 But it is a trip worth taking, and spending a good few days on the island reaps rewards. 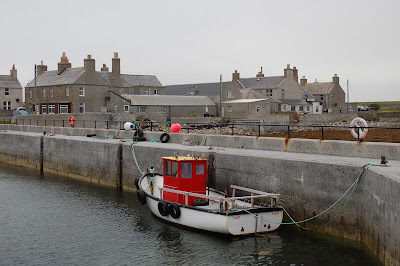 There's not really a population centre to Sanday: the school, stores, church, ferry terminal, post office and pub are scattered across the island, the nearest to urban excitement being Lady, or Kettletoft, site of the old harbour, seals sunning themselves on the rocks at low tide. 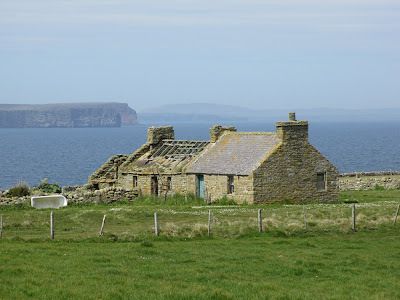 Birdsong fills the air everywhere, daisies, buttercups and dandelions bright against the green, wind tousled fields in sunshine, and when the sun goes, greyness everywhere, from the sky to the sea to the colour of the houses. Everywhere, the sight of ruined or abandoned crofts, homes now to nesting birds. Lots of islands have beaches, but there is only one Sanday*, the Sand Island, composed almost completely of machair, with a glorious beach for every wind direction. 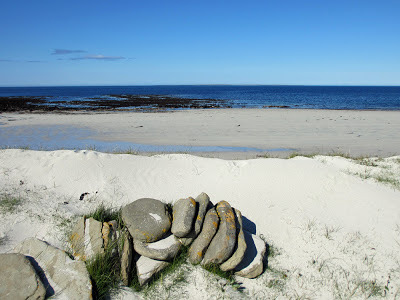 Perhaps you want the northerly facing Whitemill Bay, seals watching offshore and North Ronaldsay tantalisingly close? 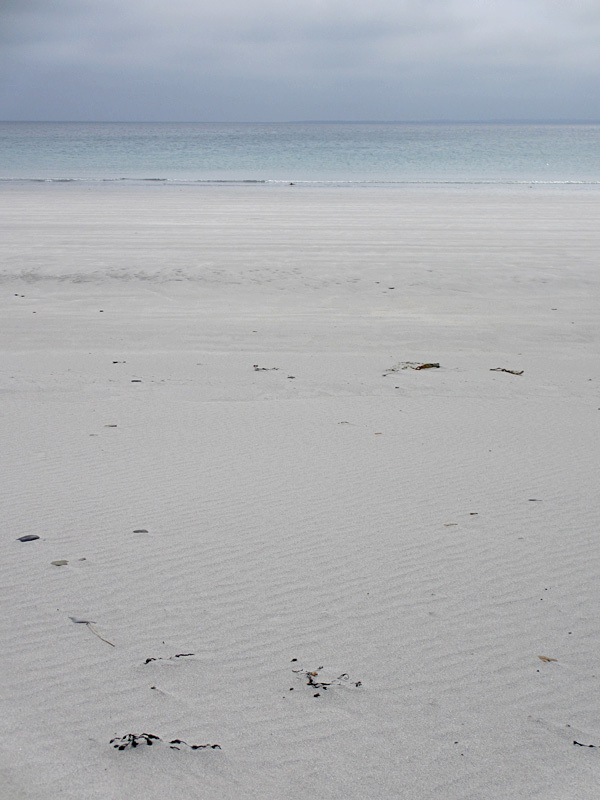 The east-facing desert-island sands of Scuthvie, perhaps? What about the long south-facing stretch of Lopness with its ruined German destroyer, remains of which visible at low tide? It is hard to pick a favourite beach on Sanday, there are so many fine ones, but my personal favourites were Cata Sand and Doun Helzie - worth future posts of their own! As a sand-based island, Sanday is vulnerable to erosion, and some of Orkney's most vulnerable archaeological sites are on this island. At Scar, a Viking boat burial was found, and quickly excavated in 1991 as the whole site disintegrated in winter storms. 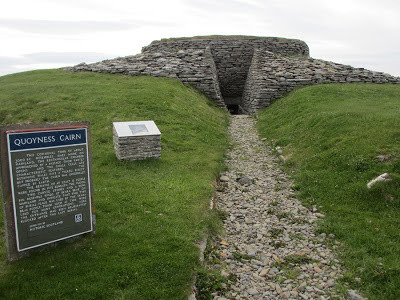 The artefacts are displayed at Kirkwall's museum, including the amazing whalebone plaque, thought to be an ironing board. Vikings doing the ironing?? They were a more complicated people than the simple image of pillagers suggests. Reading The Angry Corrie in my formative teenage years as a hill walker, the most eagerly awaited bits of the fanzine - after the Murdo Munro cartoon of course - were Grant Hutchison's vignettes of hill characters, illustrated by Chris Tyler. We roared with laughter at recognised characters like Unsolicited Advice and grimly contemplated Doomed Boyfriend: there were one or two Done That's of our acquaintance and we all wanted to be Mountain Man. I had forgotten how sharp these vignettes are. Twenty years on Grant has collated and published these stories as an e-book, Walking Types Omnibus, available from Amazon or Smashwords. Ah, my old friend Lachlan. Whilst we were in bothies, wondering where the ladies were (back in Glasgow, mainly), Lachlan was hatching another mad plot in his Dundee flat. 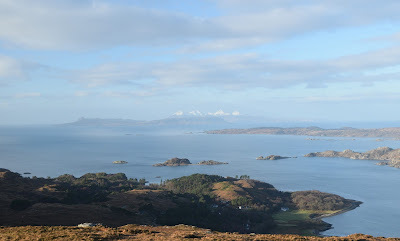 Maybe it involved capturing the Big Grey Man of Ben Macdhui to exhibit in a circus. Maybe it involved doing all the Munros in reverse height order. That was the thing with Lachlan. You couldn't tell what was coming up, but you knew it would end - after a promising start - in a slow car crash of disaster. And Grant's yarns about Lachlan, also premiered in the Angry Corrie - The Book and the Walk is typical - were another treat to read in tent, dosshouse or home. At first sight, you might think these stories will be cast from the same mould as the Doctor in The Ridiculous Mountains, but Lachlan is more anarchic, his take on the world unique, the stories closer to the tales of Murdo or even - and maybe I'm going too far here - Hamilton Coe. Available as an e-book from Amazon or Smashwords.